Advanced Task Scheduler in Windows Safe Mode | The official site of Advanced Task Scheduler software. It is possible to start Advanced Task Scheduler Service in Windows Safe Mode, so that the tasks created on the All Users tab of Advanced Task Scheduler will run automatically when Windows is loaded in Safe Mode. In general, it is possible to start any additional services and drivers in safe mode. 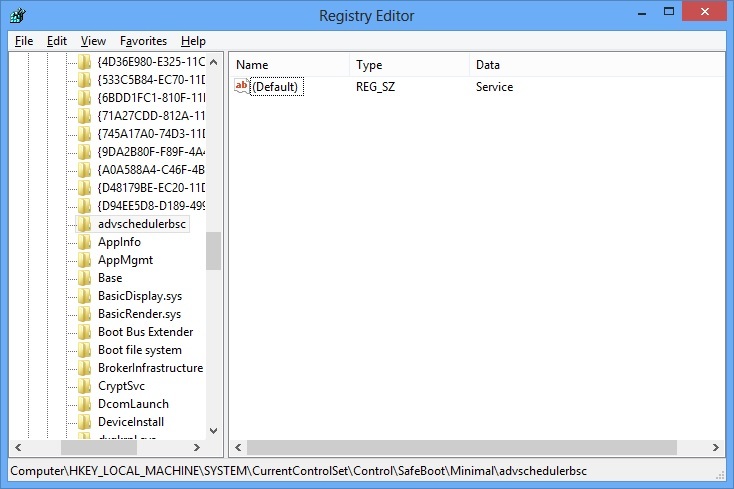 To do that, you need to start some registry editor such as REGEDIT and select the following key: HKEY_LOCAL_MACHINE\SYSTEM\CurrentControlSet\Control\SafeBoot, which has sub-keys of Minimal and Network. Minimal is for safe mode, Network is for safe mode with networking. To allow a service or driver in the corresponding safe mode, add a key for the service or driver short name, then a string for type. The screenshot below demonstrates how to add Advanced Task Scheduler Service to start in safe mode. You should always be very careful not to modify parts of the registry other than those expressly mentioned. Using Registry Editor incorrectly can cause serious problems that may require you to reinstall your operating system. It cannot be guaranteed that problems resulting from the incorrect use of Registry Editor can be solved.